We didn’t want to rush around on our first full day in Orlando, but I still wanted to make sure that we leapt right into the Disney magic! 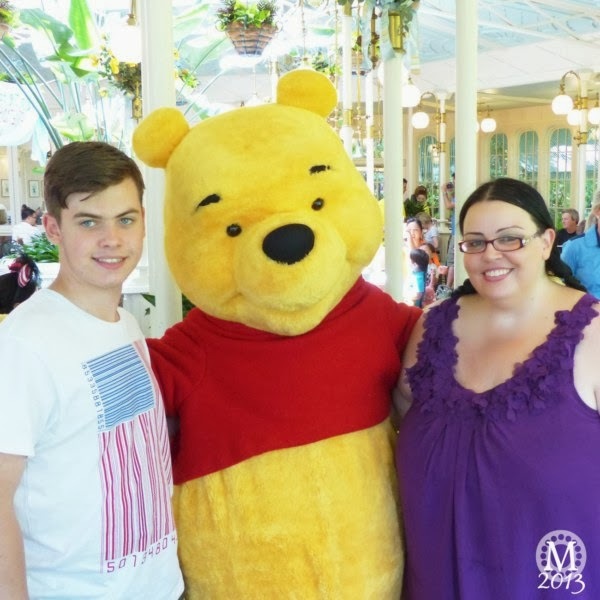 I had booked an advance dining reservation at Crystal Palace for a character lunch and the plan was to have a lazy morning at the villa, head to Magic Kingdom for around 12.00, eat and then just mooch around the kingdom until we wanted to come home. The time difference between home and Florida had us waking up at 2am and then 5am, worse than last time, and much to my annoyance as well! We crawled out of bed at 6am and watched the sun rise and all was forgiven at such a beautiful sight. With our backpack ready with essentials – water, suncream, autograph book and pen, ponchos, as well as cameras and video cameras in hand, we got into the car to begin the journey to Magic Kingdom! Our sat nav though, had other plans, deciding to direct us to the tradesmans entrance of the park. I should have known something was up when it began taking us off the 192 well before the Disney exit. But thinking, maybe the sat nav knew a super secret shortcut or something, we blindly followed it. As soon as I realised we wouldn’t be getting to the tollgate with the directions of the electronic voice, we set about trying to right ourselves. However, through tiredness (it’s my excuse) and irritability of wasting time going to the wrong entrance, we just couldn’t figure out how to get on the right side of the road…aaaargh! We ended up pulling into the Contemporary Resort and asking the security guy for directions. Firmly on our way again and cursing at the sat nav (which wasn’t to be the first time this trip!) we eventually paid our $15 and drove to the parking lot. The Villains lot was full, so we were directed to Heroes and parked in Peter Pan. Best tip ever is taking a photo of the lot name and row you are parked in. By the end of the day you really do forget, and there is nothing worse that trying to figure out what row your car is in! Always remember to do it! Was quite surprised to see Magic Kingdom so busy, and had to wait for another tram as the first one was full. I guess, having always gone very early each time we visited a park on our first trip paid off as don’t remember the crowds on entering to be as bad. Or maybe they were and it was first timers rose tinted glasses! Hubs and the boy wanted to go on the monorail, I wanted to go on the ferry. I won that battle. Even though we were all feeling tired and somewhat under the weather with sniffles, I wanted to get that magical feeling from the start. …whilst those first time feelings were not there on our second trip, the warm fuzzies certainly were! I had to hold back the tears as we glided towards Magic Kingdom – we were here again, really here again! I couldn’t believe that we had the second chance to be back at, for me, the most magical place on earth! And I’m so glad that we did Magic Kingdom first time around on this trip! We moved quickly through the gates. We had the new style plastic cards, so all we had to do was hold the card against the machine and put our finger on the pad for fingerprint scan. The whole thing the lit up green and we were through. No muss, no fuss and so much faster than the old turnstiles. By now it was midday, and we couldn’t mess around – didn’t want to be late for our 12:15 advanced dining reservation at Crystal Palace, so it wasn’t nothing more than a passing glance at Main Street as we strode towards the restaurant. I love the Disney balloons – it’s on my bucket list to buy one of them and have it floating in our accommodation for the duration of the holiday! I didn’t buy one this year… Next time! Once at Crystal Palace, we went to check in and hovered around the front of the restaurant to wait for our name to be called. There was a couple of drinks dispensers filled with ice cold water – very freshing on a very hot first day in Orlando! I was just taking a photo of Cinderella Castle [one of a gazillion!] when our name was called and we entered the lovely air-conned restaurant and shown to our table. A lovely floral display greeted us as we stepped through the doors, and I returned to take photos later on. The cast member explained that our server would be with us shortly and that all the characters will be visiting our table during our meal. We were sat at a table along the side near a window. It was good sitting here as it was away from the main hustle and bustle of the restaurant, which, with a lot of young kids, was very noisy. But I was expecting that level of noise and it didn’t bother us. Our waitress was just lovely – bright, bubbly, chatty and friendly. I initially asked for a glass of water, wanting to avoid fizzy drinks, and then she offered to make me sweet iced tea when I mentioned that I heard it wasn’t available at the restaurant…saying she was from South Carolina she makes the best sweet tea! Maybe she felt sorry for me with my plain water to drink! Tigger was already a couple of tables away from us, so we waited to meet him before heading to the buffet. Autograph book at the ready, which I’d made myself a few days before, Tigger arrived at our table, giving hugs and messing around high-fiving the boy. It doesn’t matter what your age, meeting the characters is always fun! Eeyore was over on the other side of our section of the restaurant, so we made a beeline for the buffet. Nicely spread out, but parts were a bit on the messy side, and as I leaned in to help myself to something, I managed to get something icky on my top – I was less than impressed as it was the first wearing of said top and the grease never did wash out properly. That aside, there was a good selection of salads, vegetable sides, carvery meats and fish. The kid’s buffet included mac ‘n’ cheese, pasta and mini corndogs. The food was all very good, and whilst tucking into our lunch, Eeyore began to make his way towards our table. More huggles for us, and then when he signed our autograph book he drew a little rain cloud above his name – so sweet yet so sad! The gap between us meeting Tigger and Eeyore was about 20 minutes. Pooh, followed closely after Eeyore – about 10 minutes later. As I watched to make sure we wouldn’t be missing a table visit from Piglet, I headed over to the front of Crystal Palace to take some photographs of the display. There was then some sort of parade going on in the restaurant, because it was Friendship Day. To be honest I couldn’t hear a thing of the music, but the characters marched around the restaurant with kids following behind. I took this opportunity to take myself back up to the buffet for dessert! Lots of yummy choices – peach cobbler, apple and cardamom bread pudding, chocolate cake, a selection of mini desserts and a self-serve ice-cream machine. I’m not a fan of cardamom, so the bread pudding was off the menu for me and I settled for the cobbler, as did hubs. My son went for lots of ice-cream and cookies! By now, hubs and I were stuffed and didn’t go back for seconds on dessert. The cobbler though was delicious, I’m sure all the other desserts were just as good! I find that is the only thing with a buffet – there is always so much choice, you don’t know what to have, so you have a little of lots of things and end up getting really full up! Piglet visited our table about 20 minutes after Winnie the Pooh, and was such a cutie! After lots of hugs and photos, he signed the autograph book and was delighted to see a sticker of himself on the page. He drew a little heart next to it – bless! I love when the characters get excited to see themselves! Whilst finishing off our lunch and getting ready to pay the bill, Tigger paid a surprise second visit to our table! How lucky to get two visits from the bouncy guy himself! The horror though, you can see the grease on my top! As Steve paid up the bill, which was $92.63 (plus tip) the waitress made conversation with us, asking how the food was and about our holiday. We told her it had been great food and I mentioned it was a shame I couldn’t finish off my iced tea as she had made it specially (and for some reason brought me two glasses of it at the same time!). She then said she’d put it in a take out cup for me so I could sip it around the park. We said our goodbyes to our waitress and headed back out into the Orlando heat. We walked over towards the castle, taking in our surroundings and then realised it was coming up to the show time of Dream Along with Mickey – my absolute favourite! Everything stops for that show as far as I’m concerned – absolutely love it! The first time we watched it in 2011, I was in huge girly floods of tears – totes emoshe! We waited for the show to start by standing in the shade provided by the structure over the water fountains nearby. I spied lots of Mickey Mouse shaped confetti and leaned through the railings to grab a purple one as a keepsake. Then the familiar intro to Dream Along with Mickey started and it was welling up time for me! With the day saved, the finale is upon us, another song which hits me right in the feels! We then made our way over to Fantasyland to have a look around, and then walked through to Tomorrowland. Not really doing anything other than having a wander. It was at this point that the boy told us he wasn’t feeling too well (all that ice-cream over indulgence I think) and I sent him off to the nearest loos whilst we waited in a nearby shop for him.When he returned, he asked if we would mind going home, and so we made our way back to Main Street to find the parade starting. He was happy for us all to watch that, but stood back in the shade of the shop awnings. Last time we watched this parade it was pouring, and I mean pouring down with rain, so we didn’t get to see the show in all it’s glory. We did this time though! We took the monorail back to the parking lot and found our car where we parked it in Peter Pan and made the journey home. Liam slept off the ills for a while, and was fine by the early evening. We just hung out at the villa before turning in to try for a good nights sleep for tomorrow at Animal Kingdom! Michelle this post is fantastic and the place is utterly amazing, I am afraid I have always wanted to visit but we will never get there. You managed to capture such stunning pictures .. just beautiful! I am so pleased you managed to view the parade without the deluge this time! although i do hope your son was not ill for long. Tell me about it, if you hunt in my archives for Magic Kingdom on our first trip I’ve got the video up and you’ll see it was teeming down! Magic Kingdom is a fantastic place!